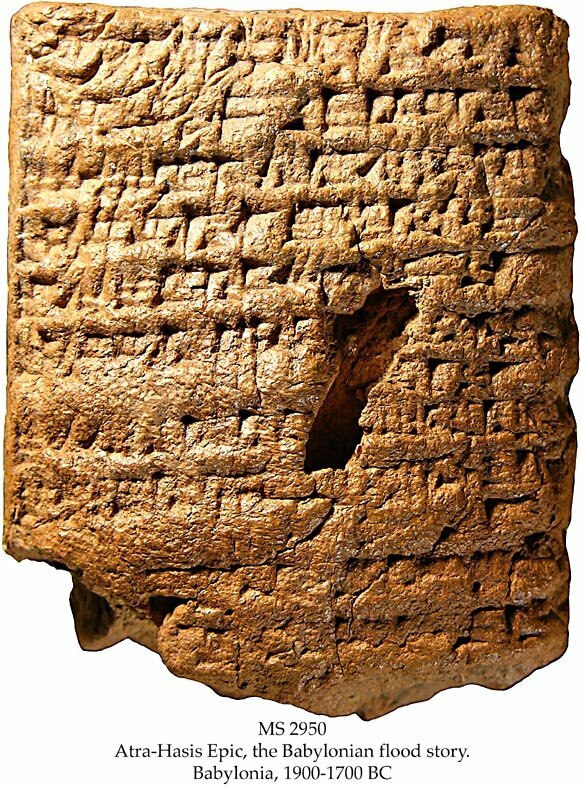 Description	 MS in Old Babylonian on clay, probably Larsa Babylonia, 1900-1700 BC, upper half of a tablet, 6,5x5,2x2,5 cm, single column, 11+1 lines of originally 40 lines in cuneiform script. Binding	 Barking, Essex, 2000, blue quarter morocco gilt folding case by Aquarius. Context	 The present part of Atra-Hasis is so far missing on all known tablets. It could belong to BM tablet I, lines 360-365, with a gap concerning the plague prior to the Flood, or to BM tablet III, column 3 after line 27, and column 4 before line 30, where 54 lines are missing, covering the flood story from its peak to the period after the flood had dried up. The primary cause of swelling is development of interior gasses following floods and drowning or famine. According to W.G. Lambert and A.R. Milland: Atra-Hasis: The Babylonian story of the flood. Eisenbrauns 1999, pp. 31-41. 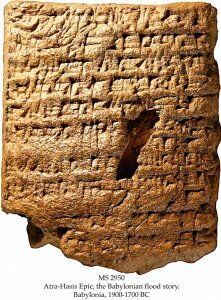 There are only some 13 tablets and fragments preserved of the Atra-Hasis Epic, in at least 4 different recentions. Very much of the epic is lost. Another part of the Atra-Hasis epic is MS 5108. Commentary	 The Old Babylonian Flood story told in both the epics of Atra-Hasis and Gilgamesh was written about 200 years before the account in the Bible, Genesis 6:5-8:22. While the cause of the Flood in the Bible was mankind's wickedness and violence, the Old Babylonian cause was the noisy activities of humans, preventing the chief god, Enlil, from sleeping, actually mentioned in the present tablet. The harsh account of swollen animals and human bodies was apparently deleted from the Biblical Flood story, even if it would have been the first sight meeting Noah leaving the Arc. Published	 Andrew George: Babylonian Literary Texts in the Schøyen Collection, Cornell University Studies in Assyriology and Sumerology, vol. 10, Manuscripts in the Schøyen Collection, Cuneiform texts IV. CDL Press, Bethesda, MD, 2009.